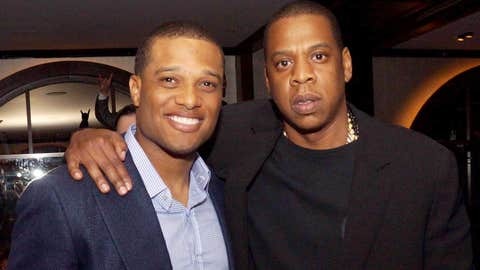 Jay Z and Robinson Cano scored a 10-year, $240 million deal from the Mariners. Wednesday was Jay Z’s 44th birthday, but Friday really was worth celebrating for the rapper/sports management mogul. It started with reports that he’d botched Robinson Cano’s contract negotiations with Seattle, and that the Mariners had broken off talks when Jay increased the proposed deal to 10 years. Don’t believe the hype. Less than an hour later Cano had his 10-year deal — for $240 million. He beat that rap — and he was just getting started. Hours later, his Roc Nation firm was informed by the NFL Players Association there were no violations of the union’s regulations in Jay’s recruitment of New York Jets quarterback Geno Smith, a source told FOX Sports’ Mike Garafolo. He wasn’t done, either. Jay capped his big day with nine Grammy nominations — more than any other artist — including Album of the Year, Best Pop Duo/Group Performance, Best Rap Performance, Best Rap/Sung Collaboration ("Part II (On The Run)" and "Holy Grail"), Best Rap Song, Best Rap Album and Best Music Video ("Suit & Tie" and "Picasso Baby: A Performance Art Film").